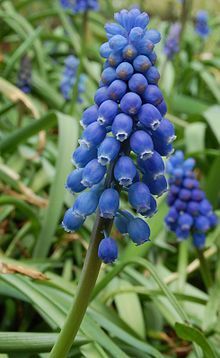 The genus Muscari, commonly and collectively known as grape hyacinths, are a group of perennial plants native to Eurasia that produce spikes of dense, most commonly blue, urn-shaped flowers resembling bunches of grapes in the spring. White cultivars also exist. Some species are among the earliest to bloom in the spring. They are planted as bulbs and tend to multiply quickly (naturalise) when planted in good soils. They prefer well drained sandy soil, that is acid to neutral and not too rich. May be found in woodlands or meadows, they are commonly cultivated in lawns, borders, rock gardens and containers. They require little feeding or watering in the summer, and sun or light shade.